The founding precept of Classical Homeopathy is the treatment of patients based on the ‘totality of symptoms’ and their experience of a disease. No two individuals with an identical disease are generally prescribed the same remedy. A carefully studied case should yield just the one remedy that fits the patient, not the disease. This is the constitutional remedy. Such responses are familiar among hard-core classicists. In the 1860s, Carroll Dunham discussed the merits of polypharmacy. While he agreed that succession of remedies, where one remedy followed another, was fine, provided that each time the case was studied for a new prescription; alternating remedies was objectionable to him. And yet homeopathy, since Hahnemannian times, has had standard protocols for everything from simple injury to severe pathology. Everyone is familiar with the good old Arnica for bruises, or Chamomilla for the angry teething nipper. Therapeutics manuals suggest numerous standard prescriptions such as Lachesis for Pneumonia in Typhoid or Sepia for freckles on the cheeks. Today, homeopathy polypharmacy is common and practised quite successfully throughout the world. Dunham implied that a successful practice does not make it a valid argument for the practice of homeopathy. Yet if patients are getting better with a handful of remedies given at once, is there then not a place in homeopathy for the non-classical approach? Someone who has proved that standardized treatments can be a roaring success are the Banerjis of Kolkata, India. Their success in treating cancers and other chronic diseases is evidenced not only by the long queues - over 1000 patients - outside their clinic every day but also by the growing popularity of their teaching seminars abroad and requests for collaborative research. They have even ventured into a space protocol for Mission and Extra-terrestrial Settlements at the Rutgers Symposium on Lunar Settlements, organized by the Rutgers University, USA in June 2007. Their protocol recommends Kali Carbonicun and Lycopodium for problems due to lunar dust , Coffea Cruda for acute radiation syndrome and Rhus Toxicodendron for post -return back pain. Dr Prasanta Banerji and his son Pratip come from a family of pioneering homeopaths who have worked in the discipline since 1863. The current Dr Prasanta’s father, also called Prasanta, was led to standardizing treatments wholly through circumstances where he was seeing a vast number of patients and found it physical impossible to undertake a lengthy consultation for each patient. He developed disease specific protocols and found he was curing about 80% of his patients through this system. His patients included the dignitaries of India such as Rajendra Prasad, the first President of India, Jawaharlal Nehru and Netaji Subhas Chandra Bose. In 1995, the Banerjis presented the paper Regression of Brain Tumors by Ultra Dilute Medicine at the 5th International Conference of Anticancer Research in Corfu, Greece. They showed the regression of 16 cases of brain tumour using the Ruta and Calc Phos protocol. In 2000, Drs Prasanta and Pratip presented a paper on Bronchogenic Carcinoma at the Comprehensive Cancer Care 2000 conference organized by the National Cancer Institute (NCI), USA, where they presented cases treated using their method of standardized treatments. Subsequently, their method was certified by the NCI and the Banerjis were advised by NCI to come up with a title for their treatment. Today the Banerji Protocols has evolved as a system of medicine where particular homeopathy remedies, in specified dilution and dosages, are prescribed for specific diseases. The Protocols have been particularly rewarding in the treatments of cancer where they work by destroying cancer cells selectively, while rejuvenating normal cells. These treatments were developed over the last 55 years. While it may no longer look like homeopathy, the Banerjis assert that their protocols evolved from a thorough knowledge and understanding of the Materia medica, along with experience and observation. Today, they treat 120 to 200 cancer cases a day. Every type of cancer has been dealt with at Kolkata, each with first, second or third line homeopathy medicines. Their research foundation is keen to show the world the ‘Before and After’ portfolio of their cancer cases. Their customized database has recorded over a hundred thousand visits and, using powerful imaging systems, they have well-documented cases that are accessible to scientists and researchers. Dr Prasanta once asked his allopathic colleagues why, after spending billions on cancer research, they have not found a cure for cancer. He says that cancer is the basic failure of the immune system. Homeopathy works by raising the patient’s immunity, and the cytotoxic effect of ultra-diluted remedies kills cells in vitro. Here Homeopathy acts in the same way as anti-bodies. In the first study by the Dr Prasanta Banerji Homeopathic Research Foundation (PBHRF), in collaboration with the MD Anderson Cancer Center, US, published in the International Journal of Oncology, they demonstrated the death of brain cancer cells with the simultaneous proliferation of peripheral blood lymphocytes. They reported both in vivo and in vitro induction of cell-survival signalling pathways in normal lymphocytes, as well as induction of cell death-signalling pathways in human glioma cells. A protocol of Ruta Graveolens 6c and Calcarea Phosphorica 3x was used in this study and is generally given in a variety of brain cancers. A 14 year old boy visited the clinic on 24th April 2013. He had experienced headache and weakness of the right hand with pain and palpitation for two months. MRI of Brain dated 14 April 2013 (Left) and follow-up MRI Brain dated 3 May 2014. An MRI scan of the brain dated 14th April 2013 showed “a large ill-defined hypodense patchily enhancing lesion with areas of necrosis and mass effect at left basal ganglia region” with the possibility that it was glioma. A two year old visited on 18th December 2013 presenting with Breathlessness and gait/walking abnormalities for two month. MRI scan of Brain on 2nd December 2013 showed “Peripherally enhancing mass (10 x 10 x 11) mm in brain-stem with mild mass effect over 4th ventricle. Brain–Stem Glioma”. A 65 year-old man presented with Haemoptysis with expectoration on 6th September 2013, which he had for a month. CT-guided FNAC of the mediastinal mass taken on 31st August 2013 showed “…non small cell carcinoma”. After undergoing homeopathy treatment all his symptoms were reduced within two months. A follow-up X-ray on 22nd October 2013 showed “no significant resolution of the upper lobe lesion”. 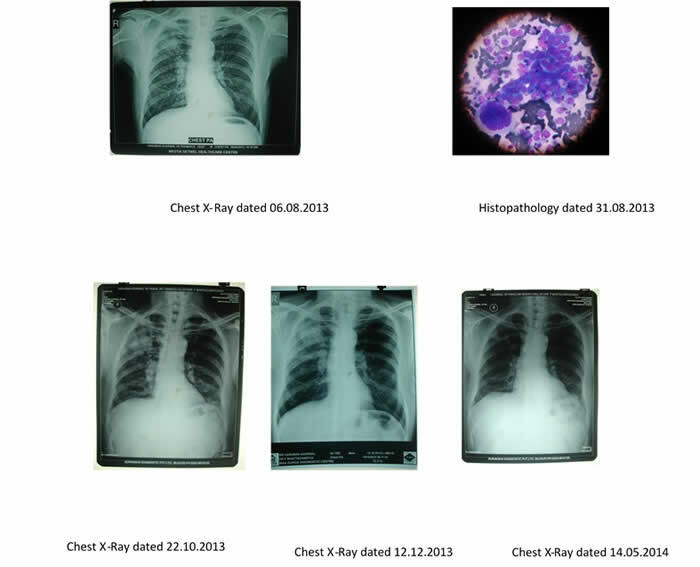 An X-ray on the 12th of December 2013 showed “a reduction of the lesion” compared to the previous X-rays. A further X-ray taken on 14th of May 2014 showed “much reduction of the mass”. The first line remedies are Kali Carb 200C in liquid, one dose on alternate mornings, Thuja Occidentalis 30c, two doses daily and Kali Mur 3x combined with Ferrum Phos 3x, two doses daily. If these remedies do not work satisfactorily then Carbo Animalis, Bryonia and Aconite are considered. Where patients display symptoms of acute cough, haemoptysis or pleural effusion, remedies such as Ipecac, Ferrum Phos, Hamamelis and Lycopodium are given. A 75 year old woman had been suffering for three months with mild difficulty in swallowing food, when she went to the clinic for treatment on 13th February 2013. Barium swallow X-ray dated 21st of December 2012, showed “Irregular filling defect at C2 and C3 vertebral level. Endoscopic Biopsy dated 4th January 2013 showed “…moderately differentiated infiltrating Squamous Cell Carcinoma”. After undergoing homeopathy treatment, the patient’s symptoms had cleared within two months. The Patient is still taking continuing with remedies. Post-treatment barium swallow X-ray of oesophagus dated 25th November 2015 showed “oesophagus is normal. No significant filling defect is seen at present in C2 - C3 level ”. Oesophagel Protocol: Patients are normally put on Condurango 30c, one dose four doses daily. This remedy helps with opening the oesophageal stricture and help food pass through easily. Second line remedies include Nitricum Acideum 3c or Carbo Animalis 200c. If these fail then Staphysagria 30c is employed. In July 2007, A 20-year old man presented with pain and swelling on his left hip, with feelings of contracture in his left thigh and restricted mobility. The previous year he had surgery for tumour on his left femur. Within six years of treatment, the symptoms improved and he was walking normally. His follow up X-ray in March 2013 showed “good consolidation in the lytic lesion “ compared to his first X-ray. Bone Protocol: Symphytum 200c and Cal Phos 3x are given every three hours alternately, with Carcinosium 30c given on alternate days. A 66 year old woman presented with dysuria and pain in the left iliac fossa for two months. An USC of the lower abdomen taken on 29th January 2004 showed “one solid mass in urinary bladder 2.8x2.4cm in size. A biopsy on 14th February showed “papillary transitional cell carcinoma of the bladder, grade 3”. She was put on homeopathic treatment and her clinical symptoms were reported to have disappeared in four to five months. A follow up USG of the lower abdomen taken on 28th March 2005 showed “no mass in urinary bladder”. She continued treatment for a further six months and then stopped it completely. The protocol for Urinary bladder cancer is Thuja Occidentalis 30 C two doses daily, Carcinosium 30C one dose every alternate day. The PBHRF has reported cancer treatment outcomes using the Kaplan-Meier survival analysis where they only included patients who had follow up visits six months or more after the initial treatment. Since half to two thirds of the patients do not come back for follow ups, their analysis looks at a smaller pool of people than are treated at the research centre. PBHRF has recorded 941 cases of breast cancer for over 10 years from 1990 to 2005. Of these 30.18% regressed while 25.40% improved or were static, 26.78% were worse or died and 17.64% discontinued treatment. The protocol employed for breast cancer is normally Phytolacca 200c two doses daily and Carcinosium 30 C, one dose every alternate day. Conium 3 C is added if results are not encouraging. Other remedies are Thuja and symptom-specific remedies such as Psorinum, Antimonium Crudrum and Arsenicum Album for aggressive open ulcers with offensive discharges. These remedies are reported to be quite effective in a large number of cases. It is claimed that the breast tumour gradually reduces in size and disappears. Their statistics for all malignant tumours from 2005 to 2014, among patients who were followed up beyond the first treatment includes an impressive 28,547 patients with 52% having improved, 32% static, 12% deteriorated or died, and 4% discontinued. It should be borne in mind that the actual number of patients are vastly more and did not make it to the database beyond the first treatment. The Banerjis are on a mission to challenge the scientific community to investigate systems of measurements apart from the molecular. Very little research has been done to identify the mechanism of action of homeopathic remedies. The homeopathic community has always struggled to gain acceptance as delivering a viable system of medicine. They hope their huge dossier of well documented cases will help with meaningful research in the future. Dr Prasanta is keen to see more homeopaths collate professional dossiers that would stand up to scientific scrutiny. “We must uplift ourselves,” he says. For homeopaths, the Banerji Protocols offer an option to cut down on consultation time: a quick and easy way to treat more patients. It is the ideal option when that elusive one constitutional remedy fails to respond. 1. Banerji Prasanta and Pratip , The Banerji Protocols, A New Method of Treatment with Homeopathic Medicines. Pratip Banerji. India. ISBN 978-93-80813-21-9. 2013. 2. Pathak S1, Multani AS, Banerji P, Banerji P. Ruta 6 selectively induces cell death in brain cancer cells but proliferation in normal peripheral blood lymphocytes: A novel treatment for human brain cancer. Int J Oncol. 23(4):975-82. Oct 2003. 3. Prasanta and Pratip Banerji. The Banerji Protocols , The novel use of homeopathy against cancer and other chronic diseases. London Workshop May 2016. Dr. Peter H Kay said.. Thank you. I run a cancer advice and support clinic for cancer patients. I have been asked about the likelihood of benefits of the Banerji health care system for cancer patients. I wish to seek further information from you. Such information will be most useful for many others. Firstly, are the Banerji cancer remedies to be used as an alternative to conventional treatments? Or, are they to be taken in parallel with conventional treatments? Secondly, a statistic that many wish to know. How many patients suffering from malignancy were treated between 2005 and 2014 and how many of them enjoyed complete remission? Thirdly, which of the different carcinosinum preparations must be used because Smit has shown that they behave quite differently (see http://www.tinussmits.com/3861/carcinosinum.aspx ). A powerful way to make changes in your life, help others change theirs. Hands-on and expert tuition. We use trusted sources for our ingredients, fresh, of the best quality, and manufactured in England. Encourages health, strength, balance through homeopathy, nutrition, herbs, supplements, kinesiology. Fine quality flower essences international ranges to help promote vitality and emotional well-being. Migra-Cap - a unique migraine cure also offering pain relief during pregnancy. A drug-free product.